For the last month or so, this scribe has trying to imagine fighter jets landing in the pasture of the five-acre Illinois farm where he grew up, the tail hooks catching mom’s garden fence, stopping the planes before they nosed into the neighbor’s kitchen. And I’ve tried to envision that same plane taking off from that same pasture, climbing out over the surrounding fields of deep green corn or soybeans. Deduct our house and mom’s garden from those five acres and there would be an area the size of the deck of the USS Theodore Roosevelt. Looks pretty big, doesn’t it? The flight deck is more than twice as long as the Missouri Capitol. 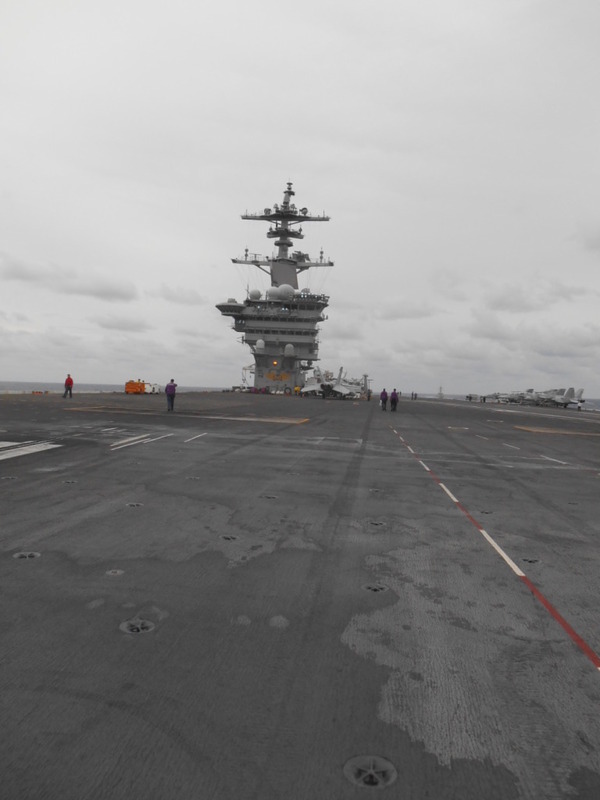 But as we watched F-18s land and take off and move around on that 4.5 acre deck, we watched some amazing things happening in a space that turned out to be pretty small. And to see those things happening on a cloudy, starless night, well, that is something to see, indeed. We started on the back side of Vulture’s Row, the top observation area to the left side of the island. 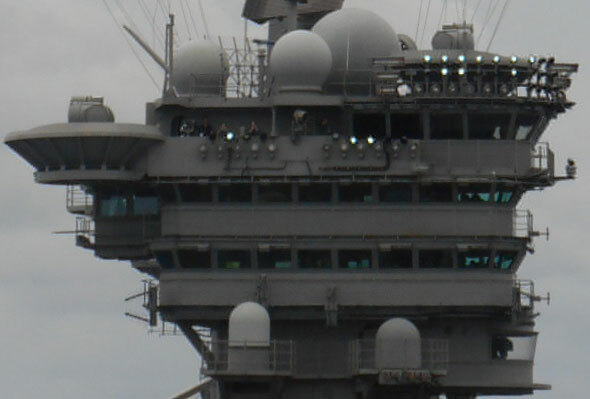 That’s the windowless deck just under the radar domes that you see here from the front. We were watching small flashing red lights off to our left, aft of the ship. There was little sense of motion as we watched that light. But the video shows we were, in fact, moving. The deck below was so dimly lighted that our cell phone camera didn’t show the light. Our escorts had ordered us to turn off any flashes in our cameras and our cell phones. The movement in the video, while not entirely an accurate portrayal of what is happening with the carrier, is a reminder that people flying these planes are skilled beyond our imaginations. It’s dark. It’s noisy. The dimly lighted carrier deck is in motion. Somewhere out there is a pilot who will, in effect, put a piece of thread travelling 140 mph through the eye of a needle moving in the opposite direction, pitching and yawing with the movement of the ocean. We’re watching a red light become three lights. And suddenly there is an F-18 on the deck below us. Good God! Our shepherds led us forward along a pitch-black gangway to watch the night launches. Blind as a bat (actually worse because bats have some kind of animal radar), I used the dim light from my cell phone screen to see what was ahead of my feet and was firmly admonished to turn the thing off. Not even that much light was allowed. That’s how serious this night landing business is. From the front of Vulture’s Row we watched a new and fascinating F-18 Ballet. Flashlights of varying colors replaced people in different-colored shirts. In a climate too noisy for voices to be heard and too dark for hand signals to be relied upon, flashlights become critical communications devices, directing the movement of planes from landing areas to ready areas to the catapults and then to the order to launch. A sudden, long streak of flame. And the F-18 that abruptly appeared below us on landing has disappeared into the dark off the carrier’s bow, leaving behind the flashlights directing the next ballet movement. The young people she was talking about on the streets of Ferguson and the young people of the same age on the flight deck of the Roosevelt are worlds apart. We saw a lot of breath-taking things on this trip. But the most impressive thing we saw, when all was said and done, was the people we met, talked to, and watched, most of them young and purposeful. 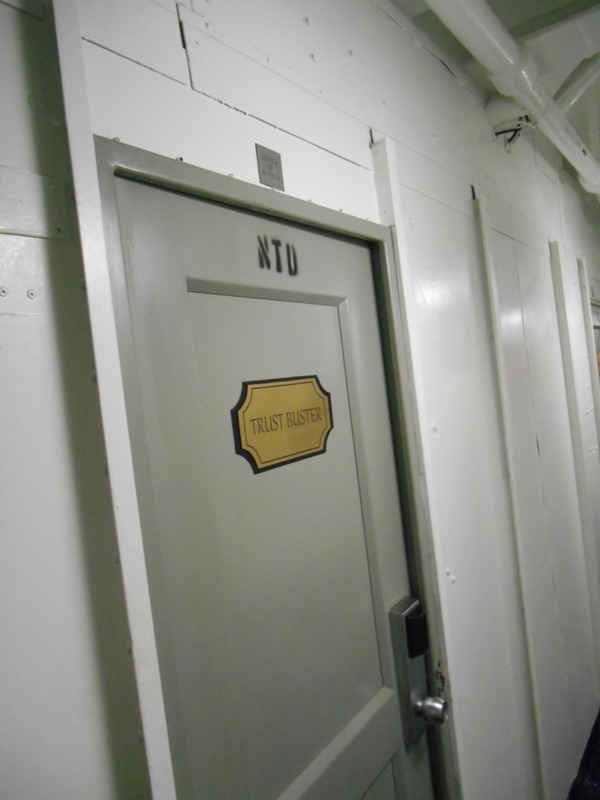 It was an honor whenever some of the members our group got to stand with them on their flight deck.. Our quarters for the night were on DV Row, a series of two-person staterooms that included a couple of small desks, locker space, bunk beds, and some shelves. The room numbers described where the rooms were located but if you had put us in the other end of the ship and told us to find our rooms we probably would have been trying to figure out the code for most of a day. 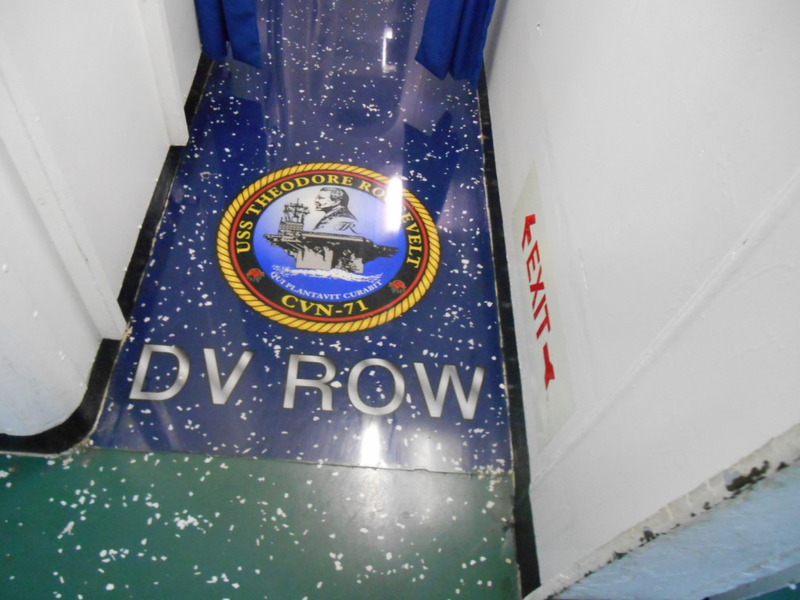 They had a “DV Row” symbol on the floor, which was a good thing because without it, we found it easy to get lost in the carrier catacombs going to and from the head, the bathroom. Do not ask an embarrassing question about the details of how the essential nature of that symbol was discovered. About the only things in our stateroom that were not steel were the mattresses and the pillows. I have wondered what percentage of the wood on the Roosevelt is in the Captain’s office and in the Executive Officers office. The reason just about everything is steel is simple. Wood burns a lot more easily than steel. Sleep did not come easy that night for roommate Greg Willard and me, in large part because we were pretty wound up from from the day’s activities culminating in the excitement of watching the night takeoffs and landings. The fact that our rooms were about two decks below a catapult certainly delayed slipping into the arms of Morpheus, as it were. The launches stopped at about 1 a.m. and we were quickly sound asleep. For five hours. The ship public address system jump-started the next day for us at 6 a.m.. 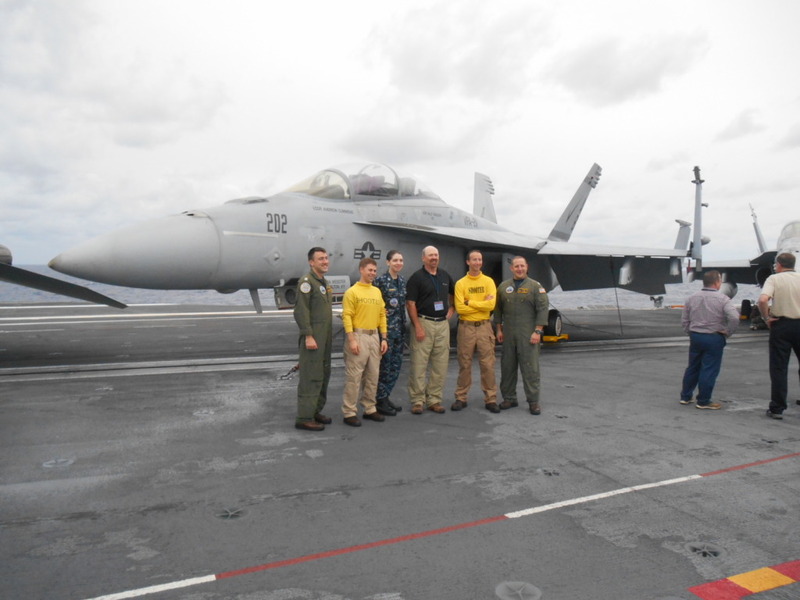 Crew members say they’ve gotten used to the noise that is part of life on an aircraft carrier most of the time. We were never buried so deeply in the lower decks that we didn’t hear or feel what was going on up top. But we’ve camped beside fast-moving streams, lived next to busy highways, and spent a night in a motel next to the Union Pacific main line in Nebraska. Eventually, we know, human systems adapt. It might take a little (a lot?) longer to adapt to F-18s being shot off the bow of an aircraft carrier right over your head, though, than it takes to adapt to a Great Smokey Mountains stream flowing past a campground. Bob: Than you for sharing your thoughts about your experience aboard the “BIG STICK”.I agree with your comments about the young crew members and the job that they perform. 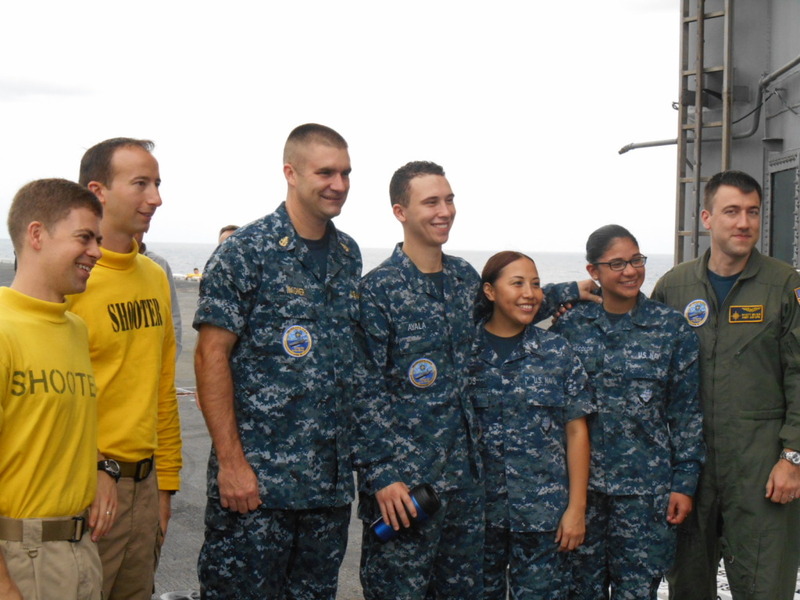 That includes the crews aboard the other ships in the fleet that support the carrier. As you know,my son, Jeff served in the U.S.Navy for 20 years. 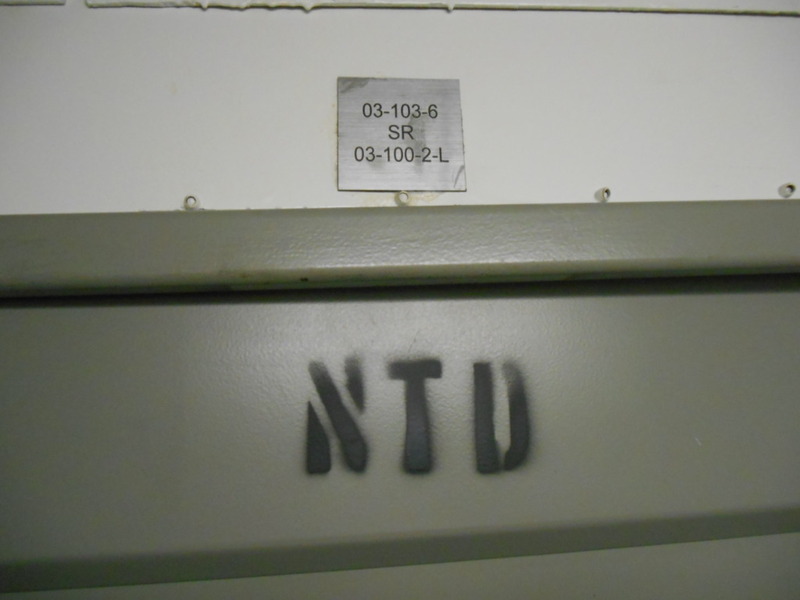 Eight of those years were aboard the THEODORE ROOSEVELT CVN 71. I couldn’t be more proud of him! I have to admit that you did a few more things than me. The night “CAT SHOTS” and your “TRAP” have made me jealous. Kudos to you.